This past Easter my son asked to dye eggs and the only way I would do it was using natural dyes. More on this here. So we had a nice amount of eggs leftover and I didn't want to make egg salad. 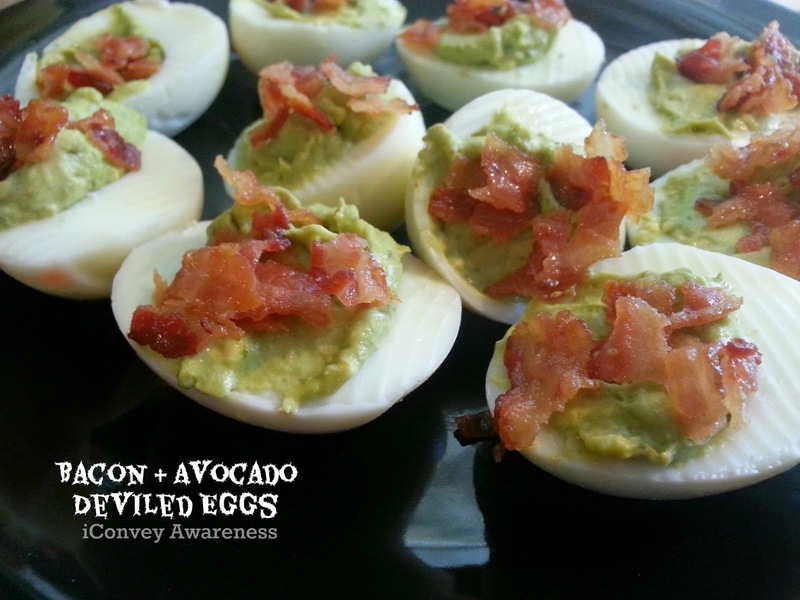 I had seen a few recipes on Pinterest for deviled eggs but I'm not a fan and I had an avocado I needed to use so I made Bacon Avocado Deviled Eggs. 1. Cook bacon until crisp. Allow to cool. Crumble it. Set aside. 2. Using a fork, mash avocado with the juice of 1/2 lemon, spices, and the garlic until a creamy texture. 3. Remove yolks from hard boiled eggs and mash them with mayo and Dijon mustard. 4. Combine the creamy avocado (step 2) and creamy yolks (step 3) together until flavors and colors are blended. 5. Take the avocado-yolk mixture and spoon into each of the halves. 6. Top with crumbled bacon. 7. Share with a friend. Enjoy! Oh my goodness, these look amazing! I am sharing this tomorrow on my Facebook page, Heal Your Gut With Food, and I pinned it! Thank you for sharing this recipe Jessica!